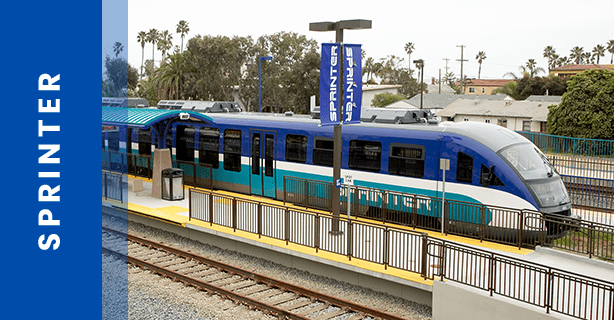 Our east-west SPRINTER hybrid rail spans 22-miles and connects Oceanside, Vista, San Marcos, and Escondido—serving 15 stations along the Highway 78 corridor. The SPRINTER runs every 30 minutes in each direction Monday through Friday, from approximately 4 a.m. to 9 p.m. Friday and Saturday trains run later. Saturday, Sunday, and holiday trains operate every 30 minutes between 10 a.m. and 6 p.m. and hourly before 10 a.m. and after 6 p.m.
Use these SPRINTER-specific links to find out more information on routes, schedules, stations, and more!